Rocky Island will give you some wonderful dives. The walls drop sharply from just a few metres below the surface to an astonishing depth and the constant currents that flow all along the year favor the growth of all different kinds of life. The walls are covered with the most beautiful soft corals, as well as gorgonians, fans, sponges and black coral trees. Several great caves and overhangs offer a great place to watch the sharks go by. Because of its isolated situation and the reduced dimensions of the reef wall, everything seems to concentrate on the surroundings of this small islet. 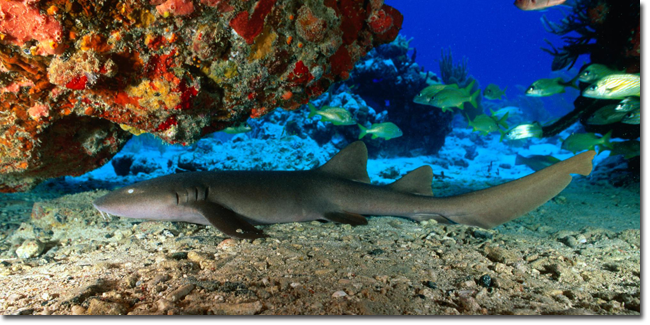 Reef sharks, especially Grey and Silver Tips, you can watch in the blue and maybe Manta Rays, Sailfish and dolphins. The Island of Zabargad is the largest island for miles around and has a fantastic turquoise lagoon. On the southern side a sandy slope with a lovely coral tower leads to the drop off where hammerheads and manta rays can sometimes be encountered cruising up and down. At the north side of Zabargad lays a nameless wreck. The 70m long ship lies upside down in 24m depths. The whole stern section is nearly intact- stairs, rail, lings, davit and the bridge. The massive reef system of St. John’s is located furthest south and offers a range of excellent dives with exciting drop-offs such as Habil Ali, Habil Gafar, Gotta Kebir, Gotta Seghir,… The walls of these reefs are overgrown with big gorgonians, soft and hard coral and huge schoals of fish congregate around spectacular vertical underwater gardens. In the blue you can see with a little bit luck “big fish” like Hammerhead, Grey Sharks, Silver Tip and White Tip Reef Sharks and Barracudas, Tunas and Mackerels. Sometimes even you can see Mantas and dolphins.